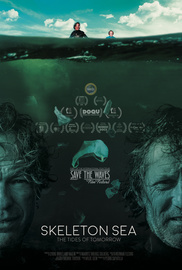 Skeleton Sea - The Tides of Tomorrow' João and Xandi, two surfers in their early 50's, have been working together for 25 years. They clean beaches by picking up trash and create stunning artworks from it. But living as an artist and idealist in Portugal is not economically profitable and therefore not easy. Their family life is affected by the choices they make and their wish to raise awareness about the ever growing pollution in our oceans. Best Surf Film & Sustainability Film - Portuguese Surf Film Festival Ericeira 2016. Best Documentary - Sun and Sand Mississippi Film & Music Festival 2016. Best Documentary Short Film - Barcelona Planet Film Festival 2016. Finalist G2 Green Earth Film Festival 2016. Winner Jury Prize - Sogndal Filmfestival 2016. Official Selections 2016: Eco Film Fest, Dokfilm Norway, Matsalu Nature Film Festival, Nordic/Docs, DocuTIFF, Earth Day Film Fest, The Quarantine Film Festival, International Kuala Lumpur Eco Film Festival & International Tour Film Festival.